Never underestimate the power of Dwayne Johnson’s charisma—or low expectations for a decades-late sequel. 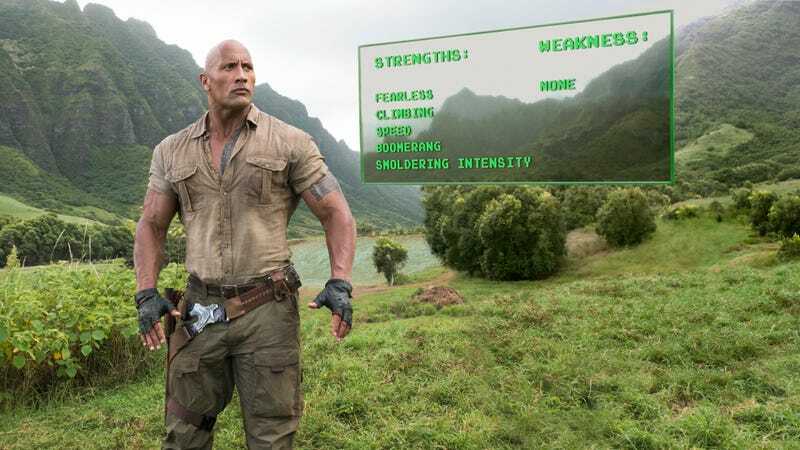 Unexpected box-office juggernaut Jumanji: Welcome To The Jungle got another jolt over the weekend, topping the U.S. domestic box office for the third weekend in a row with a $20 million haul. That brings Jumanji’s domestic total to more than $315 million, surpassing Skyfall to become Sony’s fifth-highest grossing film of all time. That elbow-drops the week’s new new releases down to second and third place, as the Chris Hemsworth war movie 12 Strong—this year’s bid for that sweet, patriotic American Sniper cash—narrowly edged out the better-than-expected Gerard Butler vehicle Den Of Thieves with $16.5 million and $15.3 million, respectively. The week’s other wide-ish release, the Nicolas Sparks-esque (in a bad way) romance Forever My Girl, lagged behind at No. 10, but given that it opened at $4.7 million on a $3.5 million budget, modest success was all the film really needed to achieve, anyway. (Rather like a big-time musician discovering that true happiness doesn’t have anything to do with fame, one might even say.) Modesty was also the order of the day in new limited releases, as Mary And The Witch’s Flower pulled in $329,097 on 161 screens, just short of making the top 25. With Oscar nominations set to come out tomorrow morning, it was a quiet weekend for prestige pics as well, as The Post dropped from No. 2 to No. 4. As far as likely frontrunners go, you’ll have to go all the way down to No. 12 for the next critical favorite, Phantom Thread, which made $3.4 million in its initial expansion from 62 screens to 896. And yes, Paddington 2, which everyone loves, was in the top 10, fell from No. 6 to No. 7. But its January 12, 2018 release date means it won’t be getting any Oscars love until next year, if at all. (AMPAS voters have notoriously short memories.) Meanwhile, Paddington 2's comrades in January arms, The Commuter and Proud Mary, didn’t fare as well as their marmalade-loving theater companion, dropping from No. 3 to No. 7 and from No. 8 to No. 11 in their second weeks, respectively. For more detailed numbers, please visit Box Office Mojo.